One of my favorite Christmas stories happened during the horrors of war. 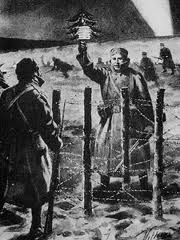 The Christmas carol "Silent Night" was responsible for a wartime Christmas truce. I researched the story and found that it is true. So here is a nice Christmas story for your Christmas celebrations to share at Christmas gatherings during this Christmas Season (was that anti-PC sentence a little too obvious?). I would normally post a story like this a little closer to Christmas Day but I found out there is a movie depicting this event and I thought you might be interested in acquiring or renting it. There are some cautions for parents contained in this review in Christianity Today but the positives seem worth the investment. Here is the story that inspired the film. The year was 1914 and soldiers were having to spend Christmas Eve night on the battlefields of France during World War I, the Great War, as it was called. After only four months of fighting, more than a million men had already perished in the bloody conflict. The bodies of dead soldiers were scattered between the trenches. Enemy troops were dug-in so close that they could easily exchange shouts. On December 24, 1914, in the middle of a freezing battlefield in France, a miracle happened. The British troops watched in amazement as candle-lit Christmas trees began to appear above the German trenches. The glowing trees soon appeared along the length of the German front. Henry Williamson, a young soldier with the London Regiment wrote in his diary: "From the German parapet, a rich baritone voice had begun to sing a song I remembered my German nurse singing to me…. The grave and tender voice rose out of the frozen mist. It was all so strange… like being in another world — to which one had come through a nightmare." "They finished their carol and we thought that we ought to retaliate," another British soldier wrote, "So we sang "The First Noël" and when we finished, they all began clapping. And they struck up "O Tannebaum" and on it went… until we started up "O Come All Ye Faithful" [and] the Germans immediately joined in …. this was really a most extraordinary thing — two nations both singing the same carol in the middle of a war." It is recorded that enemy soldiers greeted each other in the no man's land that was a killing zone the day before. The soldiers wished each other Merry Christmas and agreed not to fire their rifles on Christmas Day. The spontaneous cease-fire eventually embraced much of a 500-mile stretch of the Western Front. According to the reports of soldiers at the scene, hundreds of thousands of soldiers celebrated the birth of the Prince of Peace among the bodies of their dead. Other soldiers told of how the "enemies" exchanged badges and buttons from their uniforms. Others shared photos of wives and children and some even exchanged addresses and promised to write after the war ended. The German troops rolled out barrels of dark beer and the British reciprocated with offerings of plum pudding. Some soldiers produced soccer balls and a spirited match broke out as fellow soldiers shouted encouragement. At one location along the front the men who just the day before sought to kill one another now gathered together to bury their dead. Together, with heads uncovered, they held a service to memorialize their fallen comrades. A solitary voice began to sing Silent Night, in French. He was joined by another voice — this one singing in German — the words of a Christmas song known and beloved by all. But the miracle of peace was temporary. Slowly, under threats from their officers, the troops returned to the trenches and the recoils of rifles split the temporary "Silent Night." Some soldiers admitted aiming so their bullets flew well above the heads of the "enemy." Perhaps those of us who celebrate the birth of the Savior could learn a lesson from this Christmas miracle as we engage those who do not share our beliefs and faith in Jesus. Those on the other side of the cultural trenches are not unlike us. The message delivered in Bethlehem was peace and goodwill toward all men. When we fight the cultural war we need remember that the whole purpose of Jesus invading our space and time was to love and ultimately die for those on both sides of the battle. Pretty straight forward. Nothing in there about personal gain, power, or prestige. The power of what happened on that Silent Night united enemies centuries later on a French battlefield. My Christmas prayer is that the miracle of God becoming man will unite you and me, His followers, to seek what actually matters. To really make it about Christ and not about us. While we still have the chance to make a difference.